Hey, does midnight Sunday mean "12am Sunday Morning" or "12am Monday Morning"? I'd love to enter too! Let me just say my ever since I started reading your blog my eBay purchasing has spiked quite dramatically! Dangerous dangerous site, this one is. :) But I love it! i'm a big fan of library markings. I'd love a chance to win this! Win! Win! OOh, I'd like to win! Thanks for the chance to get this fabulous book. It was while searching for information on this very book that I discovered your website last year, which in turn proved the genesis of my interest in vintage kids' books! I've read great reviews of The Wuggie Norple Story, but have never actually read the book; our county library system doesn't carry it, and for many months I've looked for it at thrift stores and a used book store in town. The used copies being sold online are out of my price range. So I would be unspeakably thrilled not only to read the book to my kids but also to add it to our collection! We have had to buy more bookshelves for the kids since I stumbled upon your blog! Thanks! Man, oh man. Anything that involves a character named Exploding Poptart is bound to impress. Sounds like it contains some great inspiration for all those looking for a new name for their punk band. I'd love to win this one! I'm just fine with library markings...gives a book character. Why would I love this book in my (um... children's) collection? Well, Daniel Manus Pinkwater is so fun and amazing. His children's books are so different and great (I finally got "The Big Orange Splot" recently)! His teen novels are wonderful too (yeah, I read them growing up... they are wacky and weird). I have a looooonnnng list of books that I am looking for of his (mostly for myself....shhh). 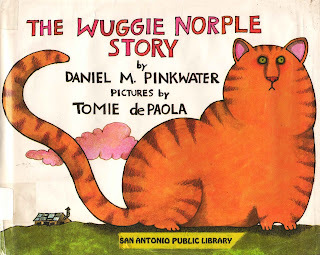 "The Wuggie Norple Story" is at the top, because we love Tomie dePaola in our house. He is such a fun artist with a sensitivity that my kids adore. I've never been able to find "The Wuggie Norple Story" (and this is a hardcover!!!). Condition schmadission those ex-library books hold up (70% of our library is ex-library)! I am desperate to win this one because my family owns a very large cat, who keeps getting bigger and bigger all the time and nobody seems to notice and I don't know what to do! Please help... I'm sure this book provides all information needed. We are big fans of Tomie dePaola. My daughter, 5.5 years old, is a big fan of silly. I just love to hear her laugh uproariously at silly books - it makes me so happy to see her get so much enjoyment from a book! Love your site. It's so fun to relive these books. I just blogged about an old favorite of mine "A Very Young Skater". Have you heard of this series from the 70s and 80s. I loved it as a child - still do. Oh oh oh! This is my absolute favorite and one I am dying to add to our collection. Pinkwater and dePaola are a dynamic combination. And if it's already well-used, we will only love it more! I'd love to win this book. I couldn't care less about condition. If it's readable it's lovable. Oh! I would love this book. The condition doesn't matter, as we get most of ours from used bookstores anyway. My child is the first young one in the family, and all the "adults" love to read to him---it is the only time he stops and snuggles! As such, we are always looking for good books, so we would love this one! Thanks! For the past 2 years we have celebrated Daniel Pinkwater's birthday by sharing his Larry books with the students. We encourage everyone to wear pink and also pass out pink bear bookmarks to all the students. It has been a fun celebration by intorducing students and staff to an author they may not be familiar with. It would be amazing to have another Daniel Pinkwater book to share with the students. Also, this book reminds me of my cat that we adopted. She seems to keep growing-wider and wider. My sister laughs everytime she comes to visit because our cat seems to expand more and more each day. This book would make an excellent addition to our collection of Daniel Pinkwater books. One for the kids and teachers to enjoy, as well as myself. Why would we love to have this book with us? Because it has beautiful illustrations, because it is funny, because it has been recommended by you, because we can't possibly get it around here (unless perhaps at full price - which I just can't afford! ), because I love books and there aren't any libraries around so I have made a mini one of used books for my child, and oh, it is just waiting for this book! In my house, we love: Daniel Pinkwater (the grownups, but we're working on the baby), Tomie dePaola (everyone, who doesn't? ), cats (me and the baby, whose second word was meow) and funny names (she giggles at them, also, we gave her one). Also, old books, and your blog. And there are no thrift stores carrying English children's books around here (as in, in the country). We've never actually read Daniel M. Pinkwater, but I know a lot of the books you feature and trust your judgement! And Tomie dePaola is a favorite. I've recently discovered that all of my daughter's favorites feature animals, so we'd love to try this one! I'd love to have the chance to win this great book. Thanks! eek! i seriously want this book! Seriously, seriously want this book! I would love to give this book as a gift to my son and his father. They are going through a bit of a rough patch in their relationship, and I believe that this lovable story about a father and a son (and a cat! and funny names!) would bring some much needed laughter into their storytime, and beyond. I loved your description of your husband and son howling hysterically as they read this together. Hysterical howling can be so good for the soul! love to win this thanks. What a fun read, I'd love to win!